From the Wikipedia entry on The Datapoint 2200 it was a mass-produced programmable terminal, designed by Computer Terminal Corporation (CTC) founders Phil Ray and Gus Roche, and announced by CTC in June, 1970 (with units shipping in 1971). It was presented by CTC simply as a versatile, cost-efficient terminal for connecting to a wide variety of mainframes by loading various terminal emulations from tape rather than being hardwired as most terminals were. However, enterprising users in the business sector (including Pillsbury Foods) realized that this so-called "programmable terminal" was equipped to perform any task a simple computer could, and exploited this fact by using their 2200s as standalone computer systems. 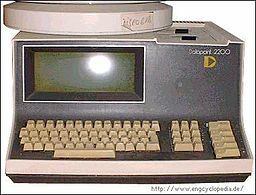 Its industrial designer John "Jack" Frassanito has later claimed that Ray and Roche always intended the Datapoint 2200 to be a full-blown personal computer, but that they chose to keep quiet about this so as not to concern investors and others. Also significant is the fact that the terminal's multi-chip CPU (processor) became the embryo of the x86 architecture upon which the original IBM PC and its descendants are based. Datapoint video #1 (or view this piece larger on YouTube or at the DigiBarn Collection at Archive.org). Datapoint video #2 (or view this piece larger on YouTube or at the DigiBarn Collection at Archive.org). Datapoint video #3 (or view this piece larger on YouTube or at the DigiBarn Collection at Archive.org). See other features on Digibarn TV!